When you're viewing a page that you'd like to save to Pocket, just click the Pocket toolbar button. Or, if you prefer using keyboard shortcuts, you can visit the Options menu to create a custom shortcut. You'll be notified that the page has been saved, and from here, you can add Tags, Archive, Undo Save, view your List, and access the Extension’s settings. In addition to saving links that you currently have open in your browser, it's also possible to save a link that you see on a web page without opening it first. 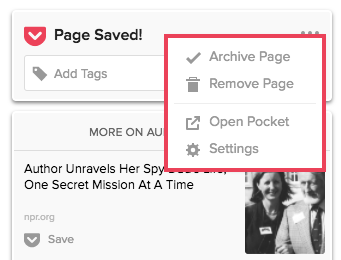 You can save links within a web page by right-clicking on them and selecting Save to Pocket. 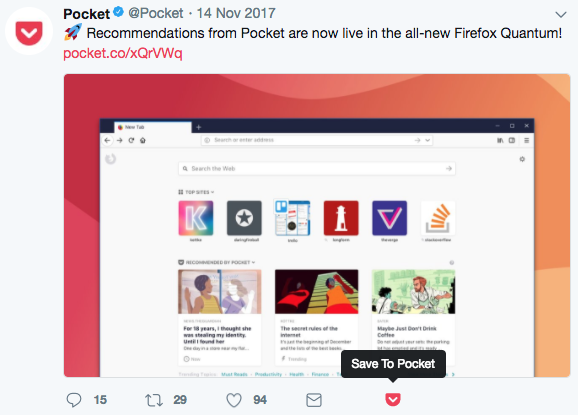 The Pocket save confirmation appears after clicking the Pocket Button to save a page. If you saved a page by mistake, you can undo it. Hover your mouse over the Menu button (•••) then simply click Remove Page. You can also go directly to your List by hovering your mouse over the Menu button (•••) and clicking Open Pocket. 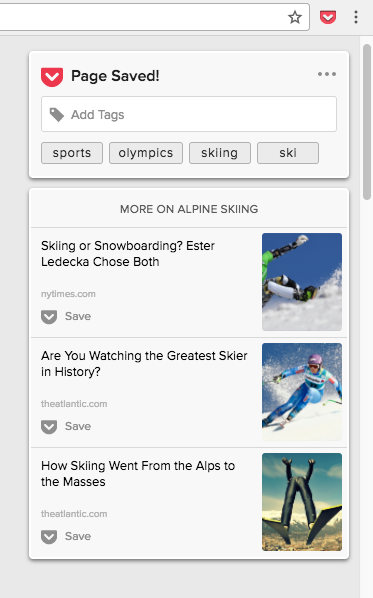 After you install Pocket for Google Chrome, you will notice that Pocket buttons are added to Twitter. When you visit Twitter, you can save articles by clicking the Pocket button below the tweet. When you save a page using the Chrome extension, you’ll begin to see a list of stories related to the page you just saved. This is a great way to dive deeper into a topic you care about. You can click on a recommendation to view it, or click the Save button to save it to your List.